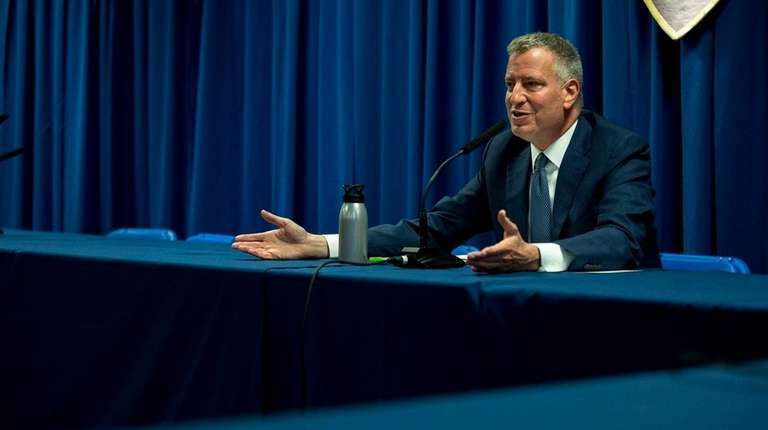 “No one’s talking about anyone lining their pockets, which, unfortunately has happened in way too many instances,” de Blasio told reporters at an unrelated event at a police precinct in Queens. Several donors on the contribution list disclosed by de Blasio’s nonprofit, the Campaign for One New York, included city real estate firms and others doing business with the city that had donations made proximate to deals with the city, but the administration argues that those are legally outside the board’s restrictions set forth in an opinion the administration itself had sought. “We are comfortable that we did everything the right way, which is the same point about disclosure. People who don’t disclose you really should have a lot of questions about,” de Blasio said. The campaign, through a political consulting firm BerlinRosen, would periodically disclose the donors upon request. The firm, along with top aide Emma Wolfe and fundraiser Ross Offinger, has been subpoenaed in at least one probe connected to the mayor. De Blasio is also facing federal and local scrutiny on a number of other matters, including the removal of a restrictive deed on AIDS housing on property being flipped and converted to luxury condos — a case involving one of de Blasio’s top fundraisers; a probe into possibly illegal funneling of contributions in de Blasio’s failed bid in 2014 to flip control of the State Senate to Democratic hands; and an unsuccessful drive to banish horse-drawn carriages from Central Park, a cause important to donors who gave hundreds of thousands of dollars to support de Blasio.